Or do we? At first blush, the argument makes perfect sense. If new customers sign two-year contracts and renewing ones sign 1.5-year contracts, it would seem to indicate that renewing customers are indeed less bullish on future usage than existing ones. Having drawn that conclusion, you are instantly tempted to blame the product, the customer success team, technical support, or some other factor for the customers’ confidence reduction. But is there a confidence reduction? 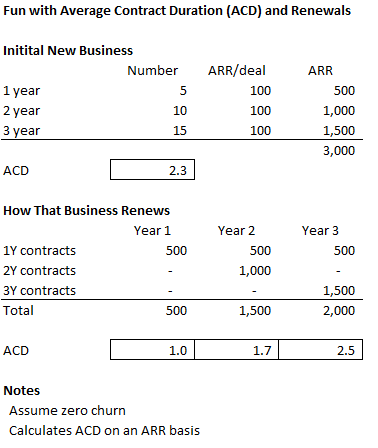 What does it actually mean when your renewals ACD is less than your new business ACD? The short answer is no. We’re seeing what I call the “why are there so many frequent flyers on airplanes” effect. At first blush, you’d think that if ultra-frequent flyers (e.g., United 1K) represent the top 1%, then a 300-person flight might have three or four on board, while in reality it’s more like 20-30. But that’s it — frequent flyers are over-represented on airplanes because they fly more; just like one-year contracts are over-represented in renewals because they renew more. Let’s look at an example. We have a company that signs one-year, two-year, and three-year deals. Let’s assume customers renew for the same duration as their initial contract — so there is no actual confidence reduction in play. Every deal is $100K in annual recurring revenue (ARR). We’ll calculate ACD on an ARR-weighted basis. Let’s assume zero churn. If we sign five one-year, ten two-year, and fifteen three-year deals, we end up with $3M in new ARR and an ACD of 2.3 years. Nothing. Only the one-year contracts had a shot at renewing and they all renewed for one year. In year 2, both the (re-renewing) one-year and the (initially renewing) two-year contracts come up for renewal. The ACD is 1.7 — again lower than the 2.3-year new business ACD. While, again, the decrease in ACD might lead you to suspect a problem, there is nothing wrong. It’s just math and the fact that the shorter-duration contracts renew more often which pulls down the renewals ACD. First, understand it. As with many SaaS metrics, it’s counter-intuitive. As I’ve mentioned before, SaaS metrics and unit economics are often misunderstood. While I remain a huge fan of using them to run the business, I strongly recommend taking the time to develop a deep understanding of them. In addition, the more I see counter-intuitive examples, the more I believe in building full three- to five-year financial models of SaaS businesses in order to correctly see the complex interplay among drivers. Armed with that model, built with assumptions based on both history and future goals for the new business breakdown and the renewals matrix, you can then have meaningful conversations how ACD is varying on new and renewals business relative to plan. Without that, by just looking at one number and not understanding how it’s produced, you run the very real risk of reacting to math effects setting off a false alarm on renewals. This entry was posted in Cloud, Metrics, SaaS. Bookmark the permalink.